My friend and boss Bill Tobin wrote a book. The title, Food to Write Home About is Bill’s answer to the sort of comment he sometimes comes across in on-line reviews. Anyone who knows Bill and his passion for the Hawaii culinary scene could imagine his reaction when he scrolls down to see: “The food was OK, but nothing to write home about”. When you’ve come to appreciate the quality and variety of Hawaii’s cuisine like Bill has, something like that could get under your skin. It’s a testament to Bill’s character that from his frustration came inspiration and not surprising for Bill, action. 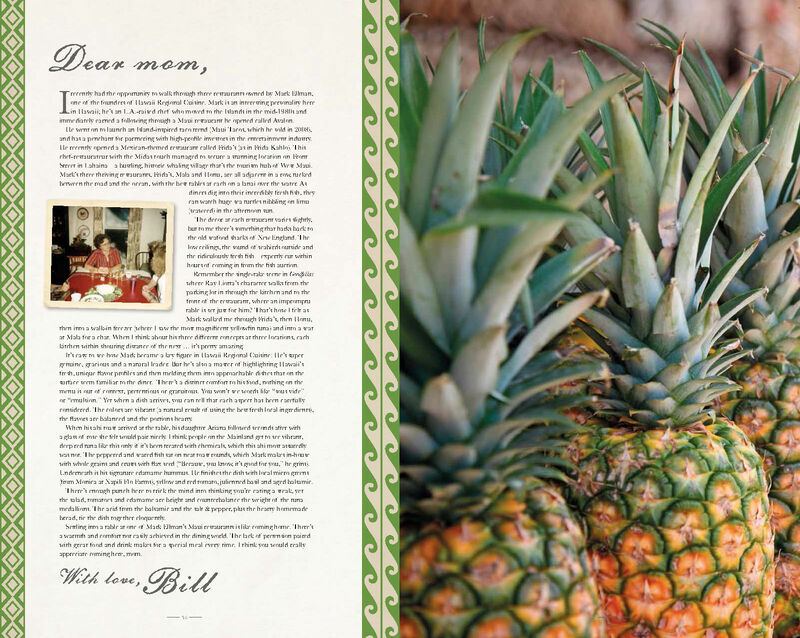 Along with his coauthor Brian Berusch, Bill has set out to tell the story of his culinary evolution in Hawaii. Each of his stories comes in the form of a letter home to his mom and he uses many well-known local chefs to illustrate each culinary revelation along the way. 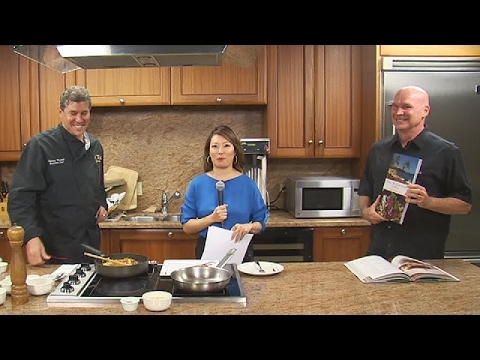 Twenty-one of Hawaii’s top chefs are featured along with a recipe from each chef. I was honored to get a keepsake copy of the book, my reward for muscling my way into the pages between George Mavrothalassitis (Chef Mavro) and Colin Hazama. Not bad company to be in. Here’s just a sampling of what you’ll find in the book. Throughout the book Bill injects little glimpses of his youth, growing up in Nebraska. He recalls his summer job picking corn tassels and bonding with his grandfather over cans of spinach sprinkled with vinegar and pork chops. These were his first culinary influences. His Grandpa Keith was the kind of guy who put honesty and integrity above everything else. Along with his work ethic, those values had a big influence on Bill. Bill includes many stories about his early days in Hawaii discovering the island’s unique mix of cultures and foods. He talks about his first jobs during college working at bars and then restaurants. In the beginning he says, it was just a way to make enough money to go out on a date. Bill and I share a similar experience having the women in our lives vastly expand both our cultural and culinary worlds. Bill’s wife is of Okinawan ancestry while my wife’s family is from Korea. Growing up in a big Italian family that revolved around meatballs and pasta, I can appreciate what it must have been like for Bill. It was a big step to go from pork chops to a platter of sushi. It was the first step in a long journey. For the book launch we joined one of the featured chefs, Goran Streng at his Tango Contemporary Cafe. Goran is originally from Finland and in the book you can read about his amazing path from cooking for the Finnish Navy to stints cooking all over the world. From embassies in Yugoslavia to the legendary Raffles Hotel in Singapore, Goran’s travels eventually led him to Hawaii. The food selection for the book launch certainly confirmed his inclusion in Food to Write Home About. I was very happy to see Mike Kealoha featured in the book. 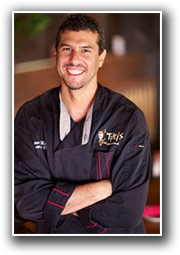 He is such a deserving chef and one that Bill and I had the good fortune of hiring. He was on the line at Tiki’s when we were transitioning away from what Bill describes as standard tourist and bar food to a menu we think represents the best of what Hawaii has to offer. Mike was a big part of that transition. Mike’s family has been smoking meat at home for years and when we first started offering Hawaii smoke meat on the menu, he was our source. Over time he got so busy it was hard for him to keep up with production for us. We still have Hawaii smoke meat on the menu but we’ve had to outsource. In the book you can learn how to make the real Kealoha family smoke meat. Mike shares all the secrets of their Hawaii smoke meat tradition. For those who have never heard it, the book also includes the story of the famous Hawaii’s Most Wanted Chefs ad. That ad eventually led to me coming to work at Tiki’s. It’s sort of a local culinary legend now but as I remember it was a really big deal at the time. I had been working for Roy’s for 10 years and I was really happy with how things were going. One day I was told by my staff that I had to check out this ad on Craigslist. I told them I wasn’t looking for a job but they insisted over and over. So my curiosity got the best of me and I took a look. I’ve known Bill for years and there was nothing that would lead me to expect anything like what I read in the ad. I thought it was a joke. As Bill tells the story (which you’ll have to get the book to read), it was no joke. It was one of those inspired-make-something-happen ideas that Bill sometimes has. Like the book. I printed the ad out and took it home to show my wife. I guess it worked because she said YOU CALL HIM RIGHT NOW. The rest as they say is history. Alan Wong, a legend in his own right, was also named in the ad. I think there’s still some kidding that goes on between Alan and Bill over Alan getting second billing behind Chef Mavro on his list. In the book you get a look behind the scenes of Alan Wong at work. It’s not widely known but Alan spends a lot of time photographing his dishes. He looks at them from every possible angle and then meticulously perfects how they look on the plate. Colin Hazama, an amazing young chef also featured in the book, credits Alan with teaching him how to see the whole plate. As Bill puts it, Colin’s plates are a work of art. Colin’s story was one of many in the book that I found really inspiring. Bill likes to shine the light on many of the up and coming chefs on the local scene. I reflect on the path of these younger chefs and how different it was from my own. I came to Hawaii young and had a base knowledge but honed my craft here. Many local chefs follow the opposite path, starting here and then honing their skills on the mainland. Colin stands out for me because he worked his way up to become a high level chef at an early age and squeezed in multiple mainland restaurants under his belt. Although the stories are all Bill, Brian Berusch does a great job of drawing out the best stuff and getting it down on paper. He lives here now but I was lucky enough to spend a few days with Brian exploring his native New York City back in 2013. His enthusiasm for the local culinary scene both in Hawaii and in New York shows in the writing and I know Bill was super pleased to work with him. Between the pages of stories and recipes you’ll also find the work of Hawaii based photographer Olivier Koning. 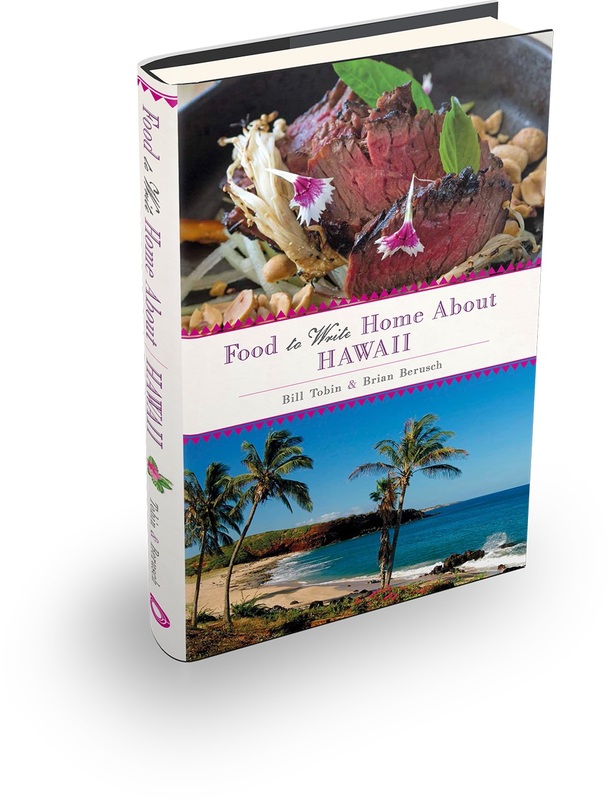 There are plenty of mouthwatering images as well as gorgeous shots of familiar local landmarks that make this book a great gift for any Hawaii foodie, whether they live here or on the mainland. Congratulations again to Bill on an outstanding effort and an awesome finished book. On behalf of everyone that has a chance to read the book, thank you for your contribution to the history of Hawaii’s culinary scene and thank you for your continued personal investment in its future. Me and Bill promoting the book on my normal Kitchen Creations spot.